Willard Joe Clouse was born on May 18, 1920 in Laurel County. His parents were John Clouse Rose L.S. Doby. He had three brothers Wallace, Lloyd, and Edward and one sister Eva Lee Clouse. Joe attended Corbin High School for four years and graduated in 1938. 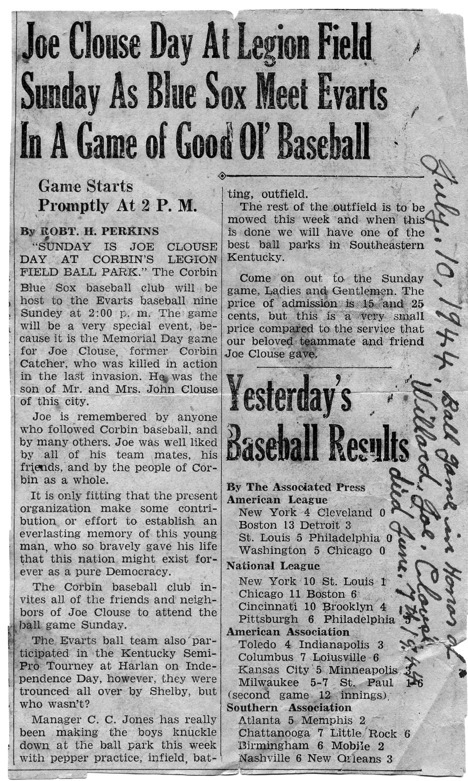 Willard played on the Corbin baseball team. At the age of 22 he enlisted in the United States Army at Fort Thomas in Newport Kentucky and became a part of the 82nd Airborne, 320th Field Artillery Battalion. His service record number is 35135378. Tragically he never got to return home to his family and friends. Willard Clouse died of wounds on June 7,1944 in Normandy, France (also known as D-day plus one). He reached the rank of Staff Sergeant and was awarded the Purple Heart, American Campaign and World War II Victory Medals. 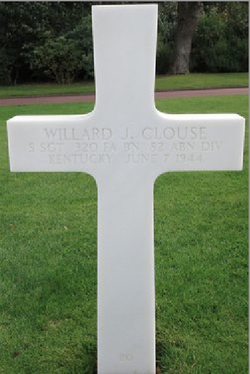 Willard Joe Clouse is buried in Plot B Row 1 Grave 20, Normandy American Cemetery, Colleville-sur-Mer, France.